This young military rapper, Komandan Ziltik Oke, member of the new Corps du Genie Militaire Haitien, say in his song he is very proud of being a part of the new Haitian military and he wants his respect in a country where people have respect for each other. "I work very hard to become a soldier." Komandan Ziltik explains in his song all the perilous training he had to go through in Ecuador in order to become a soldier of the new Haitian army. 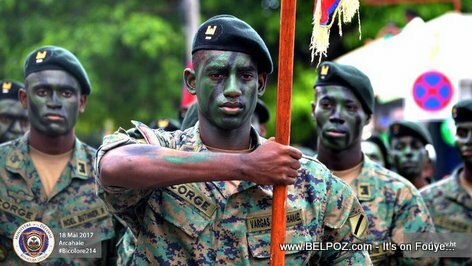 I choose to become a soldier in the new Haitian Military corps of Engineers (CORGE). Give me my respect! The rapper says in his song, Haitian do not value one another, we blame the politicians for destroying the country when we are destroying it ourselves. We do not respect each other. We enjoy degrading eachother. we do not value anything unless it is in our personal interest. "we blame the politicians for destroying the country when we are destroying it ourselves." The fact that your willing to absolve the politicians in their part of the failure of the country knowing the corruption going on and pandering to foreign interests say you are not concerned about the constitution or the people.